Welcome to the Creations by AR Design Team Blog Hop! Today, Creations by AR is releasing THREE new templates and a super cute Cut File. Each of the Designers will be giving away one of the new templates, so you'll have plenty of chances to win! To participate and be eligible to win a free template, simply leave a comment on this post, by August 31st, then check back on September 1st to see if you've won! Don't forget to hop over to the other DT members Blogs and comment for multiple chances to win! For my project I used the new Sneakies Template, cutting the template with the eCraft from Stampin' Up! 's Paisley Petals pattern paper, Not Quite Navy and Marina Mist card stocks. To adhere my pattern pieces together I used Scor-Tape. To embellish my sneakers, I added some Faux Stitching using the Drywall Stitching Technique, and a little heart charm. Aren't they cute! The possibilities are endless with these cute shoes, they'd be fun for a baby shower, and I also think they'd be great for a Teens BD with an added Gift Card or rolled up money! These are sweet, the navy & pattern & Especially the STITCHING--cute! Oh Lisa I love your two tone shoes!! I want a real pair!! Very cute--I like the color combination and the faux stitching. They sure put a big smile on my morning face! How cute and clever! how nice colors for a teenage girl, beautiful! Adorable! Love the real laces and the charm touch. Fabulous piecing of the papers. Very cute. I love the Sneakies! Wow, these are awesome, I love the red laces with that dp! My Daughter is a shoe fanatic, so this would be perfect for her! Lisa, as always, your Sneakies are just too stinkin' cute! Thanks so much for creating such fabulous projects every single time! I love the stitching! Awesome! Thnaks so much for the inspiration. Love the color you used on the sneakers!!!! Love the paper you used for the sneakers. I am loving the sneakers. Way too cute and the perfect gift holder for a Tween! I am loving the this template. So cute, lots of ideas running around in my head. Love your color choice - and the bell on the shoe lace! These tennies are pretty darn cute, blue looks good. Lisa, Love these little sneakers! These are just as cute as can be! this patter is just so unique and awesome! Really cute. I like the color combo for more grown up look. Too cute! Love the color combo used on your sneakers. So realistic looking! And, love the faux stitching and the addition of the heart charm. Lisa I just love your sneakers. I they will be fun to make for gifts. gift card...hmmm...another great idea especially for the tween or teen who thinks they are too old for any type of "craft!" LOL! love it!!! It is amazing how everyone has done such different things with this same template. I especially like the real little heart charm on your sneaker laces. Thanks for the opportunity to maybe win! This snicker template will make beautiful decorations for my Sister-in-laws Christmas tree. She collects shoes of all kinds This is just too cute. She will love this. Lisa!!! This are so very beautiful..wonder if I could get them in my size! Your sneakers are adorable! Love the touch of stitching. TFS! Very beautiful!!!!! Your sneakers are cute!! You are right, if I used different papers, ribbons, etc. these could be used for baby shower favors or at a child's first birthday party. I guess I need to look beyond the obvious "sneaker" and think what else this could be used for? Thanks for the inspiration! Great color combo on your sneakers. Love it. Your sneakers are so stinkin' cute, awesome job. A girl can never have too many "Sneakies"!!! Fabu choice on the paper and ribbon laces Lisa. The colors are lovely and the sneakie is so cute. Really cute and you did a great job! I love the sneakers - the cute ribbon laces and then I saw the little heart charm - divine! I'm really enjoying all the different sneakers, they look like a lot of fun! Love your sneakers Lisa, especially the size you have stamped inside, very authentic indeed! Such cute sneakers and I love your idea to use it for teen gifts...It would be fun to stuff "pedicure" stuff into the sneakers, too. I LOVE these!!!!! How cute is this template?!?!? Thanks SO much for sharing, Lisa! Loving the way you designed that sneaker. So So cute!!! These colors really look good on the shoe. Thanks for the chance to win. These are very cute sneakers! I love the way you designed them and the colors you used. Lisa, I just love the colors you have on these cute shoes. I hope I win and thanks for the chance. Love the sneakies. They are too cute. Wish I had a girl to make them for. Love the papers. 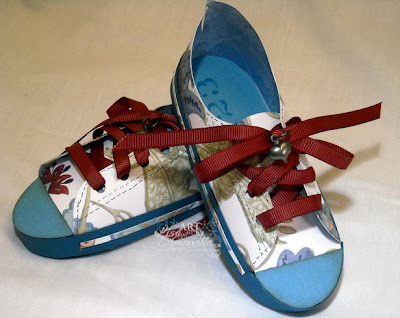 Your sneakers turned out fantastic. . .I love the designer paper you used and the fabulous colors!!! Such a fun design! Que lindas te quedaron las tenis, el color está genial. So wonderful to see all the creativity with this template! Love it! How fun are your shoes! A great gift for a student look! Love the paper selection used with the sneakies template. Nice! Very streamlined and sharp craftsmanship. Oh those little sneekies are just lovely, so well made, well done!! How fun ! the sneakies is my favorite template! Great interpretation! I love the dark ribbon for the laces. Very nice! Thanks for the opportunity to win! I just love the colour combination on your sneakies. They are so adorable. Thanks for sharing your ideas. Your sneakers are so cute. I love the colours you chose. Thanks for sharing.